Ghangharia Valley Camp is situated at a scenic location offering breathtaking views of the lush green mountains of the mighty Himalayan range covered wish mist and clouds. It is situated 13 kms from the nearest road head, on the way to Valley of Flowers and the sacred Hemkund Sahib. 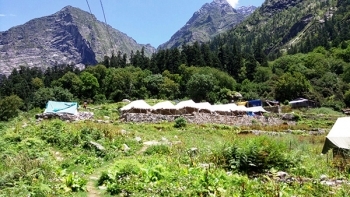 The camp serves as the base to trek to Sri Hemkund Sahib and the beautiful Valley of Flowers. 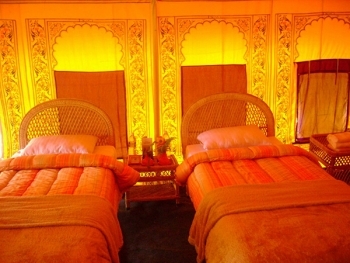 Ghangharia Valley Camp is situated at an elvation of 3050 mts above sea level in the picturesque town of Ghangharia. It is situated 13 kms from nearest road head - Govindghat. The Ghangharia Valley Camp houses a pure vegetarian restaurant which serves delicious buffet meals. Ghangaria is connected upto GovindGhat with motorable roads and from this point you have to commence an easy trek of 13 kms. Govindghat is well connected by motorable roads with major destinations of Uttarakhand state. Buses to Haridwar, Rishikesh and Srinagar are available from ISBT Kashmiri Gate. Buses and Taxis to Govindghat are easily available from major destinations of Uttarakhand state like Rishikesh, Pauri, Rudraprayag, Karnaprayag, Ukhimath, Srinagar, Chamoli etc. Govindghat is situated on National Highway 58 making it easy to reach.